This 30-mile trail loops off the Stony Spur 2 Trail or can be ridden as a stand-alone trail starting at the Dunka River Road parking lot. The trail follows some forest roads before diving off into the woods along the loop. It travels alongside wetlands, parallels the Roaring Stony River, and goes through large Pine stands as well as Birch, Maple, and Aspen woods. 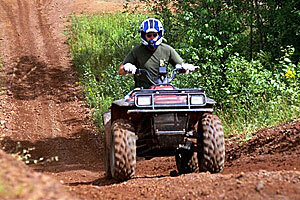 This trail is provided by the City of Babbitt and maintained by the Babbitt ATV/Snowmobile Club. From Isabella go west on Hwy 1 for 13.5 miles to Hwy 2. Turn south onto Hwy 2 and follow for 1.5 miles to Dunka River Rd. Turn west on Dunka River road.